While acknowledging some issues, Chris Mack chooses to look forward at Louisville (Cindy Rice Shelton photo). 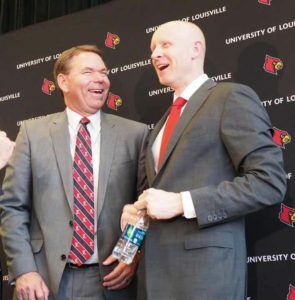 All the flack endured by the University of Louisville over the past couple of years was unfortunate but none of the issues did anything to dampen Chris Mack’s admiration of the UofL basketball program. His respect was such that he would leave his hometown and give up a nine-year coaching stint at his alma mater to take charge at Louisville. 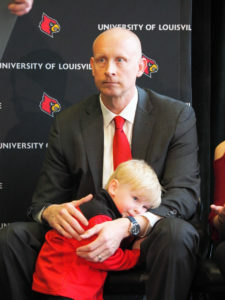 Three-year-old Brayden vied with the press with his father’s attention during Chris Mack’s introductory press conference at the University of Louisville (Cindy Rice Shelton photo). 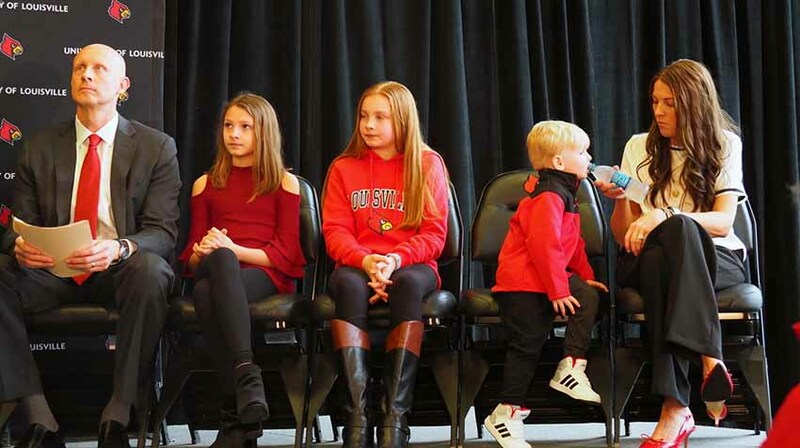 The new UofL coach was accompanied on the stage by his wife Christi, his daughters, Hailee, 11, and Lainee (12). His 3-year-old son Brayden also was there but not long, wandering the back of the meeting room where he was heavily pre-occupied with Play Doh. 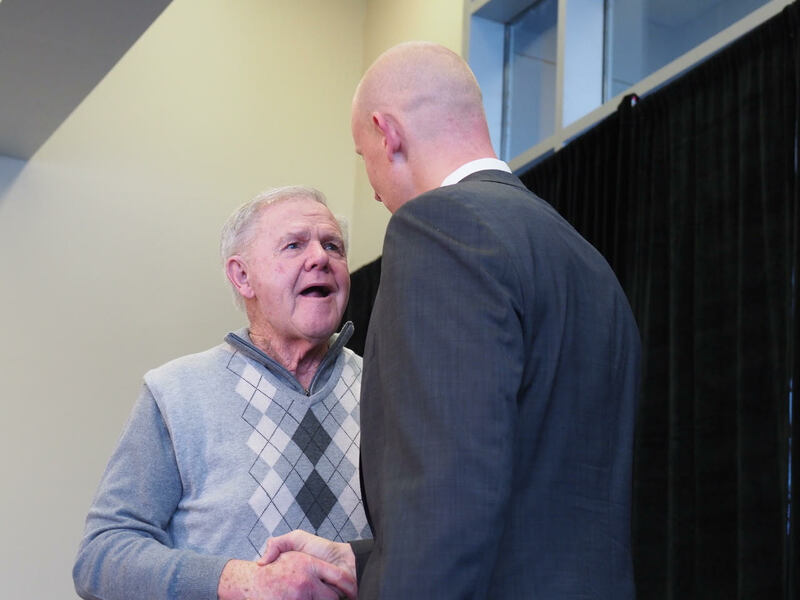 Former UofL Coach Denny Crum tells Chris Mack that he made a good decision to move his family to Louisville (Cindy Rice Shelton photo). 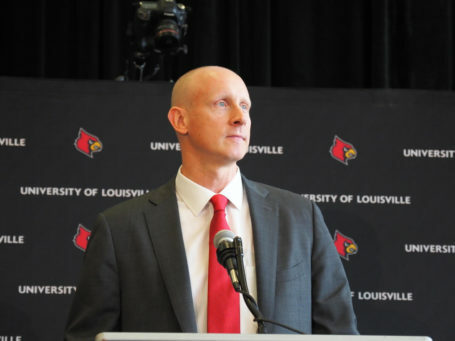 Chris Mack became Vince Tyra’s first major hire since assuming athletic director responsibilities at UofL (Cindy Rice Shelton photo). Sharing his enthusiasm is his wife, the former Christi Hester, who grew up in the Louisville area. She was runner-up for Miss Kentucky Basketball as a senior at Holy Cross High School in 1996. Runner-up to Jaime Richey, the sister of Jeff Walz, who coaches the UofL women’s basketball team. David Padgett is going to quickly win over University of Louisville basketball fans. A breath of fresh air, observed one of them following the press conference, apparently having had his fill of hyperbole from another era. David Padgett didn’t expect to be where he is but he’s going to make the most of the opportunity. Padgett would, in fact, provide solid reason for optimism during a week of mostly despair for University of Louisville basketball fans. Hope for everyone who treasures this university and regrets the way UofL is being perceived by outsiders these days. 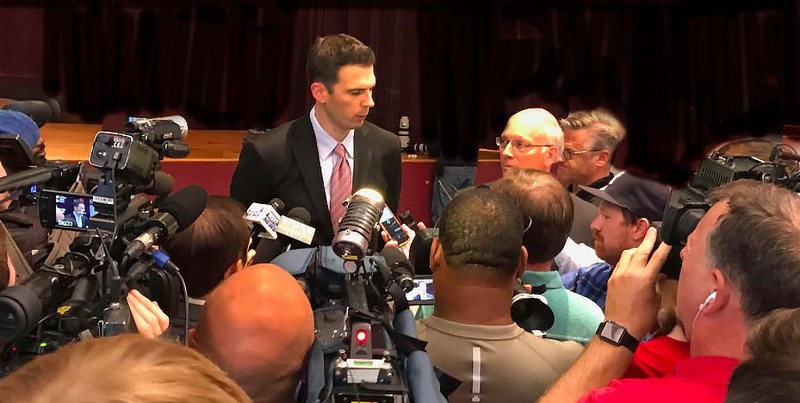 That being former UofL player David Padgett who was announced as the team’s interim basketball coach late Friday afternoon.While admitting he hadn’t slept in 72 hours, Padgett brought with him a sense of calm and purpose, giving Cardinals’ fans reason for hope, stilling the troubled waters for at least a few minutes. Padgett knows the community is going to embraces this team, too, having experienced the passion 14 years ago when he transferred to UofL after a coaching change at Kansas. “I told the team that if you put forth the effort I know you’re capable of and you handle yourselves in a professional, this city will rally around you in a way you’ve never seen before. I firmly believe that because I’ve seen it as a player, I’ve seen it as a coach and I’ve seen it in other sports. The best thing for them is that practice will begin on Sunday, enabling the players to focus on actual basketball instead of the darkness that engulfed the University following the suspensions of Coach Rick Pitino and Vice President of Athletics Tom Jurich. Padgett totally committed the next six or seven months, not knowing what lies beyond that. “We’re going to try to go out and win as many games as possible and we’re looking forward to the challenge,” he said. 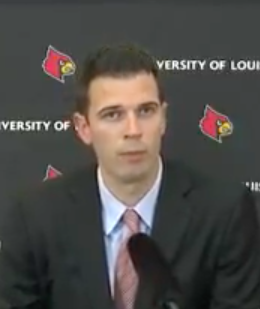 Here’s to David Padgett, interim basketball coach, University of Louisville. Excuse me. What would be wrong with a â€œbloodlineâ€ staff? â€¦ A coaching staff that includes former University of Louisville football players who are now successful coaches. Guys who have the red and black bloodline are out there and available. It could make plenty of sense. Start with Jay Gruden as Head Coach and Jeff Brohm as Offensive Coordinator. Both played quarterback for one of the best offensive minds in the game, Howard Schnellenberger. These two have very impressive pro football backgrounds. Gruden won three AFL championships as a coach and three more as a quarterback. Jeff was a pro player for five-plus years working with a wide variety of pro coaches under several offensive systems. They both know the latest spread offenses. 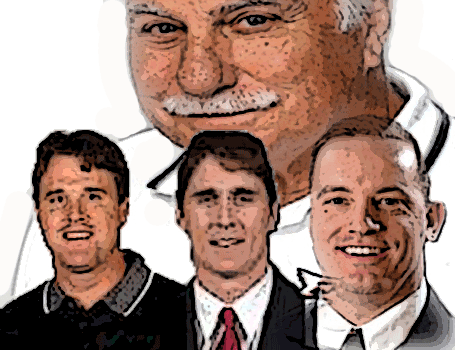 If Brohm wonâ€™t come back, Marty Lowe could be an outstanding offensive coordinator. Marty is in his second year as head coach at Western Carolina but he might consider coming back home if it fit his ultimate career path. He also played and coached in the Arena Football League. Consider Ty Scroggins, the super successful Head Coach at Central High as Defensive Coordinator. Ty could bring in Mark Sander as Linebackers Coach. Mark is a former player with the Miami Dolphins and in NFL Europe. He also coached for Howard at Florida Atlantic and is currently the head coach at DeSales High School. Mix in some coaches Jay Gruden would bring and you have a staff bound to be loyal and definitely committed to winning big time. I personally think Jay Grudenâ€™s track record indicates that he is a winner. And after recruiting in the AFL where the players have to hold down part time jobs to help support themselves, college recruiting could seem a whole lot easier. Think about it. Jay might possibly be a better choice than you thought â€œChuckieâ€ would have been. He might even win big and actually stay here.